Public fleet departments are in a unique position to have an impact on reducing petroleum consumption and harmful emissions while saving money for their departments. Fleets for the Future (F4F) is a partnership between regional councils, Clean Cities coalitions, and fleet industry leaders with the mission to increase the deployment of alternative fuel vehicles (AFVs) across the nation. The project scope includes vehicles powered in a variety of alternative ways: battery electric, plug-in hybrid, natural gas, propane autogas, and hybrid upfits of medium and heavy duty vehicles – plus the supporting infrastructure (supplies, equipment, and services). F4F believes an important piece of completing its mission is to increase the knowledge and understanding of AFVs, and work together to address and overcome the potential challenges of the transaction costs of procuring AFVs. With 10 million public and private fleet vehicles currently on the road in the United States using over 95 percent petroleum-based fuels, fleets have a real opportunity to reduce their petroleum consumption, make a positive impact on the environment, and save money. • Alternative fuels allow drivers and fleet managers to reduce petroleum use, minimize emissions, and save on fuel costs. • Alternative fuels reduce dependence on foreign exports and create a more stable energy market less susceptible to supply and price volatility. • Alternative fuels offer air quality benefits to make communities cleaner and safer as well as help meet increasingly stringent emission requirements and Corporate Average Fuel Economy standards. Funded by the U.S. Department of Energy Clean Cities Program, the Aggregated Alternative Technology Alliance, known as “Fleets for the Future” (F4F), seeks to achieve nationwide economies of scale for alternative fuel vehicles (AFVs) through aggregated procurement initiatives. procurement initiatives, thereby increasing the deployment of alternative fuel vehicles in public and private sector fleets. F4F will enable fleets to obtain vehicles that will both reduce emissions and operate at a low total cost of ownership. AFVs that use electricity, propane autogas, and natural gas all have desirable benefits, including less reliance on foreign petroleum, reduced fuel costs, reduced maintenance costs, and contributions to local air quality improvement. In order to achieve these savings, fleet managers must justify the higher upfront cost of investing in AFVs. By harnessing the power of cooperative procurement to reduce transaction costs and to obtain bulk pricing, F4F aims to reduce the upfront cost premium and make an even stronger case for investing in AFVs. In order to prepare stakeholders to successfully deploy AFVs in their fleets, the F4F team has compiled fleet management and procurement best practices specifically relevant to alternate fuels. These best practices build upon both the extensive information provided by the U.S. Department of Energy and a number of recent successful case studies. The specific goal of these best practice guides is to educate procurement officers, fleet managers, and other interested stakeholders to plan for a large-scale deployment of AFVs. The motivations and/or decision criteria for deploying alternative fuel vehicles (AFV) varies from one fleet to the next, and even within a fleet from one application to another. Fleet motivations are often a mix of petroleum displacement targets, emissions reduction/air quality (AQ) improvement goals or mandates, economic savings, and/or a desire to show community leadership in advancing alternative fuel technologies. While savings and emissions reductions might be the primary motivations behind a fleet manager’s specification of natural gas refuse trucks or propane autogas shuttles, sustainability and leadership by example might be the underlying reasons for deployment of light-duty AFVs as these applications use less fuel, have longer payback periods, and offer life-cycle savings. This guide does not assume any prioritization of these motivating rationales, but merely presents potential options and factual foundations on which to apply evaluation. • Reduced fuel and maintenance expenses, often leading to a lower total cost of ownership (TCO). Fleets continue to deploy NGVs and propane autogas vehicles in greater numbers every year due to these gaseous-fuel vehicles’ advantageous attributes. As low-carbon, clean-burning fuels, they reduce emissions. Ample domestic supplies of natural gas, propane autogas, and well-developed delivery infrastructures instill confidence in long-term low and stable pricing and energy security. A growing selection of vehicles and engine platforms are available from major original equipment manufacturers (OEMs) and an expanding network of experienced, vetted aftermarket suppliers. The vehicle sales and service supply channel is maturing with OEMs, aftermarket system manufacturers, second-stage upfitters, and others coordinating more closely to reduce cost and delivery times while enhancing service capability and convenience. NGVs and propane autogas vehicles have logged hundreds of millions of miles of reliable performance in fleets of all sizes and duty-cycles, many of whom have worked collaboratively with OEMs and other gaseous-fuel technology stakeholders to apply their real-world experience to advance the next generation of vehicles. Increases in the number of compressed and liquefied natural gas (CNG and LNG) and propane autogas locations continue to make these AFV options more convenient and viable for fleets, while also building greater confidence in the consumer market. Many states are implementing policies and programs favorable to AFV use, further accelerating market adoption and facilitating economies of scale. The most obvious benefit of using natural gas vehicles (NGVs) and propane autogas vehicles (LPGs) is that they displace gasoline and diesel use, which reduces reliance on crude oil from foreign sources. Diversification of the nation’s fuel portfolio and greater use of domestically produced energy resources strengthens national security, creates jobs, and contributes to the American economy. Over 98% of natural gas used in the U.S. comes from North American wells, supplemented by increasing amounts from renewable sources such as landfills, wastewater plants, and other agricultural waste streams. Over 90% of U.S. natural gas supply comes from the lower 48 states, with the remainder coming from Canada and Mexico. Based on current usage, estimates of natural gas supply exceed 100 years. Propane supply is derived from three sources; naturally occurring deposits deep beneath the earth (along with other high-Btu liquids often found in conjunction with natural gas deposits); as a byproduct of oil refining; and a small, diminishing amount of seasonal imports to serve specific geographic regions. The U.S has been a net exporter of propane since 2011. With the major increase in domestic natural gas drilling over the past seven years, propane production from underground sources now accounts for about 69% of all U.S. supply – up from less than 50% a decade ago, and it is projected to grow even more. While some U.S. propane supply comes from oil refining, no oil is imported for the purpose of producing propane. 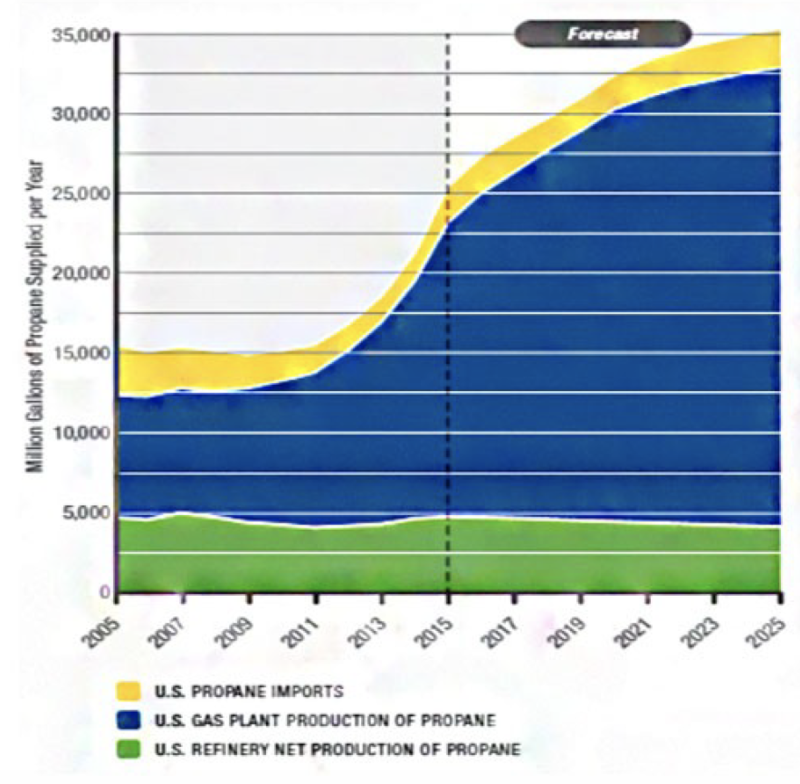 Long-term forecasts of American natural gas and propane supply are strong, indicating ample supply. This abundance translates into price stability. Natural gas commodity prices have been low and relatively stable, fluctuating within a limited range since the addition of large amounts of shale gas beginning in 2008. The huge increase in domestic well-produced propane combined with low crude oil prices have substantially reduced the national average market price for propane from previous highs. Currently, national average wholesale propane pricing is a weighted hybrid of oil pricing and natural gas pricing at the major supply points. The distribution systems for natural gas and propane are both strong. Nearly all natural gas distribution is accomplished through a well-developed network of 300,000+ miles of interstate pipelines traversing the entire continental U.S. These interstate pipelines feed into more than 2.2 million miles of local gas distribution company networks serving 17 million individual customers. Propane distribution also relies partially on interstate pipelines supplemented greatly by rail, barge, and trucking. The sudden increase in total volume and greater geographic diversity of propane supply from natural gas liquids exploration has introduced new distribution channel dynamics that propane industry stakeholders are working out (as of 4th quarter 2016). Development of additional propane storage capacity will provide further supply and price stability to the propane marketplace. It is common in propane autogas fleet applications to enter into long-term fuel contracts, alleviating the risk of price fluctuations. 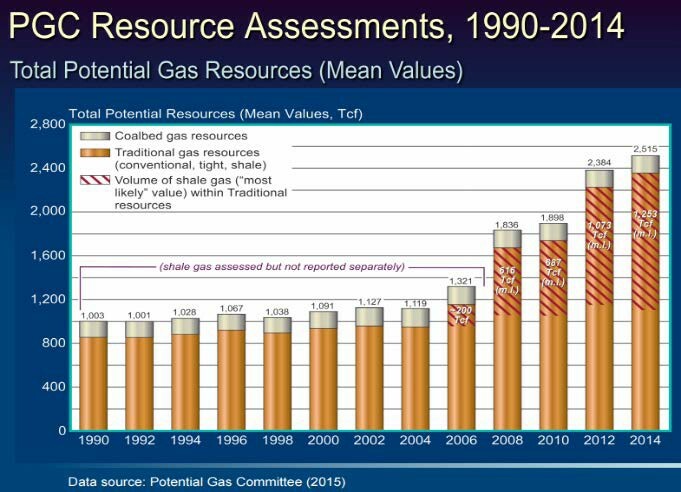 Figure 1: ColoradoSchool of Mines Potential Gas Committee Resource Assessment 1990-2014 Natural gas reserves are estimated at ~2884 trillion cubic feet (Tcf). Annual U.S. consumption is ~27 Tcf/ year, indicating a 100+ year supply. Note the impact of shale gas additions from multiple basins since 2006. Abundant, distributed supplies facilitate ability to respond to demand and contribute to price stability. Figure 2: U.S. Historical and Forecasted Propane Supply (Chart provided courtesy of IFC, 2016 Propane Market Outlook, PERC) Note the tremendous increase in propane from natural gas liquids processing that began in 2010. This shift in supply portfolio has had a stabilizing impact on propane autogas pricing. Emissions reductions are usually viewed from two perspectives: 1) “tailpipe” emissions (i.e. emissions produced by the vehicle) and 2) “well-to-wheel” emissions (i.e. total emissions generated from an energy source to end use including extraction, processing, transportation, and vehicle propulsion). Federal on-road vehicle and engine emissions regulations focus on criteria pollutants, primarily oxides of nitrogen [NOx] and particulate matter [PM], and – in more recent years – greenhouse gases (GHG). As low carbon fuels, both natural gas and propane autogas reduce criteria pollutants and GHGs as compared to gasoline and/or diesel. Light-duty NGVs and propane autogas vehicles produce slightly less NOx and PM emissions than those running on gasoline, and, when compared to heavy-duty vehicles running on diesel, provide even more significant emissions reductions. NOx reductions are increasingly important in high-population regions, where nearly half the U.S. population now resides in areas the Environmental Protection Agency (EPA) identifies as being in nonattainment with federal standards. Vehicles running on propane autogas or natural gas also reduce well-to-wheel GHGs when compared with gasoline or diesel. The amount of GHG reductions for each fuel varies depending on duty cycle, with greater reductions for light-duty vehicles and lesser reductions for heavy-duty vehicles. Two key determinants of total cost of ownership (TCO) are fuel and maintenance expenses. Natural gas and propane autogas have a history of lower fuel prices than gasoline and/or diesel and are projected to be lower than these conventional fuels in the future. Over the last seven years (2010–present), the range of savings has been as little as 15% to as much as 60% or more. The amount of savings provided by each fuel varies regionally and the relative advantage shifts over time. Furthermore, which fuel provides the greater fuel savings advantage shifts from time to time as the underlying component costs of each fuel type is quite different. While comprehensive independently-verified comparative maintenance cost datasets across multiple vehicle platforms are not available, anecdotal information shared by fleets over many years indicates that light- and medium-duty NGVs and propane autogas vehicles have lower maintenance expenses than their gasoline and diesel counterparts. Observations by heavy-duty sector fleets have been mixed; some high-annual-mileage, over-the-road Class 8 tractor fleets report slightly higher NGV maintenance costs than diesel ($.015–.02 more per mile), while waste and transit fleets often cite maintenance costs less than diesel by as much as five to seven percent. The differences in maintenance costs are typically associated with natural gas engines’ use of spark plugs, valve lashing adjustments, and more costly low-ash oil, partially or completely offset by lower exhaust after treatment system expenses (i.e. natural gas units’ use of stoichiometric cooled exhaust gas recirculation (EGR) combustion and maintenance-free three-way catalyst exhaust system as compared to diesel units’ requirement for periodic cleaning of diesel particulate filters and selective catalytic reduction (SCR) system sensor repairs/replacements). Simply stated, fuel cost savings is the difference between using alternative fuel (propane autogas or natural gas) to do the same job as conventional fuel (gasoline or diesel). Inherent in that calculation is normalizing for energy equivalence and adjustments that may be appropriate to account for differences in engine efficiency. Forecasting fuel cost savings requires speculation about future fuel costs over the projected life of the vehicle or, at the very least, over the time frame that the analysis is to be applied, such as the fleet’s usual vehicle replacement timeline or “disposition” mileage benchmark. For this reason, it’s important to understand the component costs of each fuel and how shifts in their respective component costs impact pump price. NGV and propane autogas vehicle maintenance is similar to maintenance performed on gasoline or diesel vehicles. While engine oil, fuel filters, brake system components, and other normal wear-and-tear items need periodic inspection and replacement, the engine oil specifications and types of fuel filters used will differ. Some maintenance tasks will be eliminated while others will be added. For example, heavy-duty spark-ignited NGVs do not use diesel particulate filters, SCR-injection systems, or related DEF fluids, but they do require spark plug changes and valve lash adjustments. Additionally, NGVs have coalescing filters that need to be drained periodically. The tools needed for NGV and propane autogas vehicle maintenance and repairs are essentially the same, and technician training is required to familiarize technicians with the two technologies’ unique fuel properties, fuel systems, and components, with special emphasis on safe practices for working with fuels at elevated pressures. One major advantage of natural gas and propane autogas is that they are both very low carbon fuels that, when combusted, produce very little soot. This reduces engine wear. For heavy-duty vehicles such as shuttles, buses, and trucks, this often translates into longer engine life. Less combustion soot can extend engine oil change intervals by as much as twice the usual interval. It is recommended that fleets use oil analysis – not oil appearance – to ensure appropriate lubricity or viscosity properties remain. Since organizations use different economic metrics in their budgets, definitions of fleet savings will vary. Some use life-cycle cost analysis, taking into account all expenses from purchase through retirement of the asset, including purchase price, operation and maintenance (O&M) expenses, and residual value to come up with a net total cost of ownership (TCO) over the life of the vehicle. For others, capital budgets are separate from O&M budgets so their focus tends to be on lowest O&M for the life of the vehicle. Still, others may apply a mix of financial criteria and require that simple payback is achieved in no more than “X” years or “Y” mileage. NGV and propane autogas purchase premiums are expressed either as the incremental charge by the OEM for their factory-built units or the price of the aftermarket system retrofit. Fuel capacity has the greatest impact on CNG incremental charge or upfit price, accounting for 50-75% of the premium. That’s why it’s imperative to not over-specify fuel capacity beyond needs. Generally, propane autogas vehicle premiums are equal to or slightly less than their NGV counterparts. This is because, as a low-pressure liquid fuel system, propane autogas tanks require less space and cost less than comparable amounts of CNG. However, propane autogas vehicles usually come with larger fuel capacities than otherwise comparable NGVs, thus prices are similar. The latest generation liquid propane injection (LPI) engine systems cost more than traditional vapor propane injection systems. O&M expenses include fuel, maintenance, and various peripheral expenses such as insurance and registration. The baseline an AFV option is compared to is typically the conventional fuel vehicle it will replace, but may be another AFV option if transition away from conventional fuels is already determined. The first step in determining fuel cost savings is to calculate the fuel needed by each AFV option to accomplish the same task as the vehicle it replaces, taking into account energy equivalents as previously noted. Next, multiply these projected fuel amounts by their estimated prices over the life of the vehicle, and compare total fuel costs. This calculation requires forecasting future fuel costs per gallon, either through estimations or via quoted contract pricing. Note that three-to-five year contract pricing is available from many natural gas and propane autogas suppliers, while petroleum contract pricing is usually much shorter term – rarely more than a year and often far less – placing the fleet at greater risk of potential price increases in out years. Gaseous fuel vehicle maintenance expense comparisons should take into account the benefits of cleaner combustion (e.g. potential for extended oil change intervals, less fouling of fuel injectors and spark plugs; for heavy-duty vehicles, maintenance-free exhaust after-treatment systems). They should also include pricing for gaseous-fuel-specific parts and supplies, such as fuel filters, engine oils, and spark-plugs. For CNG vehicles, the cost of periodic fuel system inspections should also be included. In regards to insurance, registration, and other peripheral administrative expenses not associated with the vehicle duty cycle, these should be comparable to those incurred for their gasoline or diesel counterparts. A possible exception is insurance for an AFV, as it may be slightly higher based on its higher replacement value. Residual value refers to the money a fleet may recover via sale at the end of a vehicle’s planned deployment. For example, a fleet may determine that a sedan will be sold after five years of use or at a predetermined mileage benchmark, such as 75,000 miles. The proceeds of sale are usually subtracted from the total of the incremental or retrofit cost plus O&M expenses to determine TCO. There is little empirical data available about residual values of gaseous fuel vehicles. The few studies that have been done, albeit on small samples in limited geographic areas, have shown that gaseous fuel vehicles have residual values either comparable to – or slightly better than – their conventional fuel counterparts. Anecdotal information produces two observations worth mentioning. First, residual values of gaseous fuel vehicles tend to be better in areas where fueling infrastructure is ubiquitous. This is especially true for low-mileage light-duty sedans, SUVs, and pick-up trucks, as these vehicles are popular with both consumers and small businesses. Second, residual values of refuse trucks tend to be higher than their diesel counterparts in areas where there are mandates or incentives for AFV use, driven by demand from smaller independent contract haulers who may not be willing or able to afford a new alternative fuel truck and for which a used vehicle allows them to compete with the major waste haulers who have already committed to AFV use. When calculating gaseous-fuel vehicle TCO, it is important to take into account the potentially extended life of these clean combustion vehicles. Calculations using a longer life cycle lower the amortized capital cost per mile. If using a simple payback analysis, longer vehicle life translates into additional years of fuel cost savings after the initial purchase price premium is recovered. This section focuses on information needed to garner greater participation and achieve success in AFV vehicle purchasing, including stakeholder engagement in the selection of vehicles, opportunities to facilitate collaboration in the supply chain and between regional fleets, and technical considerations. The primary goals of purchase cooperatives generally include 1) reduced pricing through economy of scale, 2) faster order-to-delivery time frames, 3) improved service/support capabilities, and 4) expanded fueling infrastructure (indirectly). Organizers should focus on a limited number of vehicles/platforms with pre- determined specifications that are most likely to attract the greatest buy-in, and facilitate collaboration of potential stakeholders, including vendors and purchasers. For gaseous fuels, organizers will need to consider how increased vehicle inventories in a defined area might be leveraged to improve fueling infrastructure, even if the initiative has no direct responsibility for procuring the infrastructure. This includes collaboration with local Clean Cities Coalitions to engage diverse fleet sectors (i.e. government, commercial, industrial) to gauge the potential for NGV and propane autogas vehicle purchases and create fueling infrastructure synergy. Working collaboratively to organize a vehicle purchasing cooperative can be an effective way to achieve critical mass for gaseous-fuel vehicle deployment, garnering lower pricing, faster delivery times, and expanded fueling and service infrastructure. Assessing the needs and concerns of all potential participants through surveys and interviews is essential to identifying applications and vehicles that have the greatest potential for aggregated purchase. This includes understanding vehicle duty-cycles and fuel capacity needs and how existing or potential new fueling infrastructure might impact those needs. Those who organize aggregated vehicle purchase cooperatives may find it useful to contact others who have gone through the process to glean lessons learned and best practices. Ultimately, coordination and information sharing with regional fleets, both public and private, can achieve critical mass for gaseous fuel vehicle deployment and support additional development of support services, including better local maintenance, service options, and fueling infrastructure. In 2017, F4F launched a national public fleet procurement program through a partnership with the National Joint Powers Alliance® (NJPA) designed to increase the deployment of alternative fuel vehicles and infrastructure by aggregating demand and reducing upfront costs. Participants will be able to purchase and lease discounted vehicles through NJPA’s wide variety of contracts. To assure a successful initiative, NJPA and its vendors have ensured vehicles meet federal emissions requirements and are designed and assembled in accordance with nationally recognized safety standards. Working with F4F and many of its awarded vendors, NJPA is working to provide alternative fuel solutions to the public sector agencies it serves. The organization’s goal is to increase the number of alternative fuel vehicles in public fleets across the United States. NJPA’s cooperative purchasing initiative provides national procurement F4F can utilize to bring solutions, including everything from small vehicles to larger trucks, refuse haulers, electric vans, and even charging stations, to these agencies. In order to achieve these savings and benefits, fleet managers must justify the higher upfront cost of investing in AFVs. By harnessing the power of cooperative procurement to reduce transaction costs and to obtain bulk pricing, F4F aims to reduce the upfront cost premium and make an even stronger case for investing in AFVs. Since 1993, the U.S. Department of Energy’s Clean Cities program has supported community-led efforts to help fleets and consumers find alternative fuel or fuel-efficient solutions that meet their needs. Clean Cities’ nearly 100 local coalitions across the country work to reduce petroleum consumption, limit pollution, and save money. The National Association of Regional Councils (NARC) serves as the national voice for regionalism by advocating for regional cooperation as the most effective way to address a variety of community planning and development opportunities and issues. NARC’s member organizations are comprised of multiple local governments that work together to serve American communities – large and small, urban and rural. The Mid-America Regional Council (MARC) is a nonprofit association of city and county governments and the metropolitan planning organization for the bi-state Kansas City region. Governed by a board of directors made up of local elected officials, MARC serves nine counties and 119 cities, with a population of 1.9 million. MARC provides a forum for the region to work together to advance social, economic, and environmental progress. Since its beginning in 1972, MARC has worked with its regional stakeholders on environmental issues. Their work in energy-related topics started in 2009 when it coordinated an effort to create a Regional Energy Efficiency and Conservation Strategy, which has guided the region’s work ever since. MARC and local governments in the metropolitan Kansas City region have collaborated on many energy efficient projects, such as high-efficiency streetlights, solar ready best management practices, climate resiliency strategies, and promoting alternative fuel vehicles through its bulk procurement program. The Kansas City Regional Clean Cities Coalition (KCRCCC) is a public/private partnership established in 1998 to promote clean transportation, specifically to reduce air pollution, strengthen the local economy, and curb regional dependence on petroleum. It provides technical assistance, education, training, media assistance and support policy-related initiatives for its members and stakeholders throughout western Missouri and eastern Kansas. Members include organizations, companies, and individuals who are interested in promoting the use of cleaner alternative fuels and vehicles in order to improve air quality and health, curb dependence on petroleum, minimize climate change, and support the local economy. Its staff is funded and supported by Metropolitan Energy Center, which also provides funding and project administration for members. The organization’s efforts are guided by an Advisory Board, which is elected by its membership each year. Metropolitan Energy Center is a 501(c)3 charitable nonprofit that manages the KCRCCC and the Wichita-based Central Kansas Clean Cities Coalition. Since 2003, MARC has offered a cooperative purchasing program, Kansas City Regional Purchasing Cooperative (KCRPC) in partnership with the Mid-America Council of Public Purchasing (MACPP) and local governments, which helps public organizations increase their purchasing power and decrease administrative costs. In the F4F project, MARC worked through KCRPC and in cooperation with MACPP to insert alternative fuel vehicle specifications in the 2017-2019 model year vehicle bid. MARC will work with the region’s local government fleet managers to promote and increase the use of alternative fuel vehicles. MARC will also work with the Metropolitan Energy Center to promote the purchase of alternative fuel vehicles to private-sector fleets and individual consumers through outreach and education efforts.